Description: NS 2621 with help from HLCX 5971 pull a mixed train Northbound toward the Lexington yard. This photo was taken behind the Fayette Mall at the Reynolds Road overpass. Title: NS 30T pullin in the "B" track along the side of 36A pullin in the "A" track into Enola Yard. Title: 36A at Right, on the "A" track, 30T at Left, on the "B" track. Puller crew ahead of 30T shoving up the Interchange into the EB Receiving. Description: An ex-Union Pacific SD60 still wearing it's Union Pacific paint sits in Enola Yard as a hump job works with a high hood GP38-2 and SW1500. Description: Eastbound on track one with an ex-UP rent a wreck trailing. Description: NS 38Q changes crews on the siding with a big consist of seven units including four HLCX SD60s. NS 22A sits on the mainline waiting for 38Q to proceed eastbound. Description: A look at some locos in the NS Yard. Description: I prefer the solid blue as opposed to UP armour ylw and grey. Description: A trio of newly reactivated HLCX SD60's sit at Watkins yard!! Description: 5971 shoves by old NW signals at the east leg of the wye. 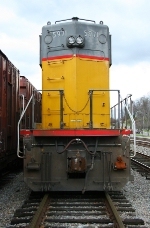 Description: Photo taken with permission from a railroad employee.